Darlings, what better way to kick off a New Year, than with a quest in mind of finding… the one? Or, better yet, watching two ultra-gorg celebrities strive to do just that on the big screen a la the perky Anna Faris, and swoon-worthy Chris Evans – stars of the film What’s Your Number? Surprise, surprise, lovers! 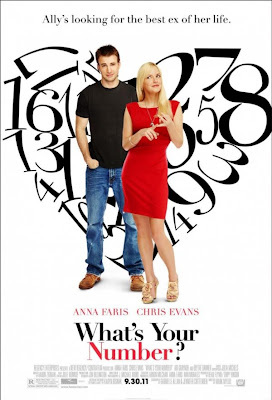 Café Fashionista has teamed up with Twentieth Century Fox Home Entertainment to bring one (1) lucky reader their very own copy of the tres-hilarious What’s Your Number? What is Ally’s last name? ♥For one (1) entry, leave a comment on this post stating what Ally’s last name is between now and Friday, January 13, 2012 at midnight PST. ♥For two (2) entries, Tweet about this giveaway, and leave a comment on this post stating what Ally’s last name is between now and Friday, January 13, 2012 at midnight PST with your Twitter URL. ♥For three (3) entries, become a follower of Café Fashionista on Blogger/Google Reader/Google Friend Connect, or Twitter @cafefashionista, and leave a comment on this post stating what Ally’s last name is between now and Friday, January 13, 2012 at midnight PST (if you are already a Café Fashionista follower, please say so in your comment). I will randomly pick one (1) name out of a hat (who knows, it could be yours! ), and announce the winner on Saturday, January 14, 2012. Thanks to Twentieth Century Fox Home Entertainment for the picture. Ally Darling has the perfect name for this film. This film is a lot of fun. Especially, for a girl's night out at home. Darling is Ally's last name. This is definitely a modern romance with lots of laughs. Darling is the name to go on for the main character. Chris Evans definitely showed his funny side in this film. I'm going with Ally Darling, on this quiz. Also followed you and @foxhomeent on twitter! quem sabe ano que vem sai aqui no Brasil.. Darling is her last name! Her last name is Darling and I love any and all things that Chris Evans stars in. Just want you to keep that in mind. Have a good Friday. partnering with 20th century Fox, go Erika! good luck to the entrants. i followed FoxHome on twitter!! Darling is her last name! I follow you, too! Oh I wish this movie were available on cable--I am so in the mood for a fun romantic comedy tonight! Hope your Christmas holiday was a good one Erika and wishing you all things bright beautiful and lovely this 2012! hope you are enjoying the holidays, Erika! Just dropping by to greet you a prosperous 2012!! !